Greg Badros is the vice president of Engineering & Products at Facebook, leading advertising, search and data science. Prior to working at Facebook, Greg was the senior director of engineering at Google, and led the AdSense engineering team as well as Gmail, Calendar, and Reader. He joined Facebook in 2009 and grew the advertising systems to hundreds of billions of impressions per day. Andrew Benede developed membrane technology that has revolutionized the water treatment industry and brought clean water to communities across the world. He founded ZENON Environmental Inc. and the resulting “Z-Weed” membranes are currently used in over 440 wastewater and drinking water treatment plants across the globe. 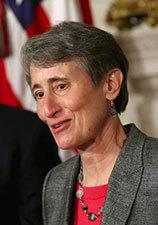 Sally Jewell is the 51st United States Secretary of the Interior, leading an agency with over 70,000 employees. In this role, she is responsible for stewarding 20 percent of the nation’s lands, including national parks and wildlife refuges. Prior to becoming Secretary, Sally was the president and CEO of REI, a national outdoor retailer and the nation’s largest consumer cooperative. Jon Magnusson is the former chairman and CEO of Magnusson Klemencic Associates (MKA), an international award-winning structural and civil engineering firm in Seattle. He has been responsible for the structure of Seattle landmarks including the Experience Music Project, Benaroya Hall, Safeco Field, Seahawks Stadium, and the Seattle Central Library. Marleen Martinez develops spacecraft for lunar exploration for the Lockheed Martin team at NASA Johnson Space Center. She hopes her work with the Avionics Systems Engineering Group will realize her goal of becoming an astronaut. Closer to home, Martinez offered her insights to help develop STARS program that supports highly motivated students who are eligible for financial aid. See Martinez featured on PBS' Makers: Women in Space at about 49:00:00. Steve Rogel is one of the pulp and paper industry’s most respected and well-known leaders. During his tenure as CEO, he guided Willamette Industries to the top of the market and transformed Weyerhaeuser into one of the largest forest products companies in the world. John Roundhill is the former vice president of product strategy and development of The Boeing Commercial Airplane Group. During his 37 years at Boeing, he served in product development and engineering positions that include Director of Engineering for the 737/757 programs, and Chief Project Engineer for the 767 Freighter. For the 777, his responsibilities included preliminary design, product development, and marketing. As a two-time graduate of the UW, he served as the Boeing liaison for many years.